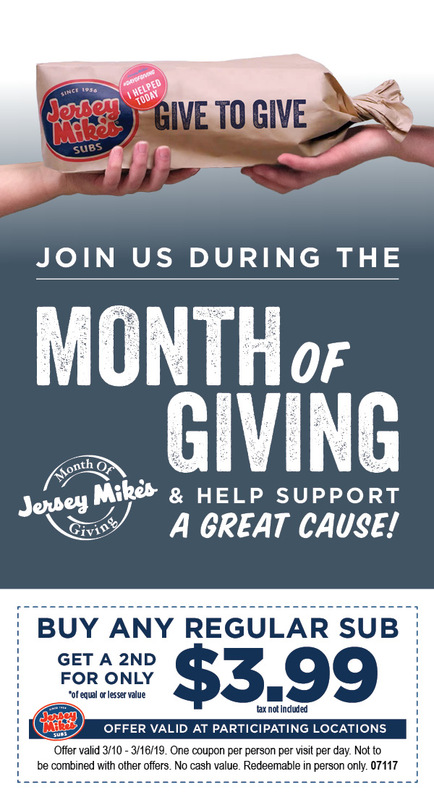 Children’s Hospital & Medical Center is joining forces with local Jersey Mike’s Subs restaurants for the 9th Annual March “Month of Giving” campaign to fund local charities. During the month of March, customers can make a donation to Children’s at participating Jersey Mike’s restaurants. The campaign will culminate in Jersey Mike’s “Day of Giving” on Wednesday, March 27, when the Jersey Mike’s restaurants at Village Pointe and Aksarben Center will give 100 percent of the day’s sales – not just profit – to Children’s. On Day of Giving, local Jersey Mike’s owners and operators throughout the country will donate their resources and every single dollar that comes in to more than 180 different charities including hospitals, youth organizations, food banks and more.